So I decided to do it––participate in National Novel Writing Month. Also known as November to sane people. 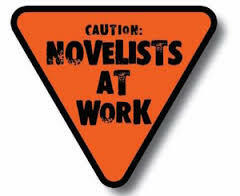 To clarify, I intend to ride on the coattails of those who have seriously committed to write a 50,000 word novel in a month, be propelled forward on the fumes of your momentum. I’m already many months in. I’ve been working, some days with only tenacity pulling me through, other days with triumph, but my aim is to finish the first draft by the end of the year with this push. I have established a daily word count that I must meet, so it’s all above board, see? I haven’t signed up on the NaNoWriMo website but I’m quite serious all the same. I just can’t be bothered with the daily checking of another website on my relentless roster. I hope you don’t consider me a dilettante. I mean well. And it’s no skin off your NaNose now is it? I remember last year, bloggers’ posts of impressive word counts and spontaneous plot twists. 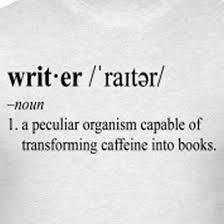 I was still an early-days blogger finding my way, with a just-released novel, so while I may have vaguely wondered about this strangely named writing-related activity, I wasn’t about to embrace it on top of everything else. My head would have popped right off and impaled itself on the chandelier. Now it’s screwed on tight to withstand this whole writing/blogging mash-up, so I’m giving it a go. 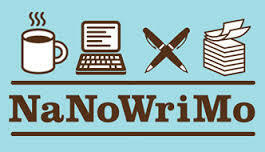 I took a little squint at the NaNoWriMo website to get my bearings. Boy, there are a lot of people using it to write novels. In my New York area alone, 20,325 to be precise. Although London is close with 20,290. When not daunted I feel inspired at the thought of all those heads bowed over keyboards in rented rooms or sunlit conservatories or pub corners or garden sheds across those two throbbing literary metropolises. Not to mention the 670 members hard at work in Greenville, North Carolina and the 50 members in Cambodia. Just think, during Christmas, we can eat, drink and trim trees with our novel practically bound and on bookstore shelves in time for next summer’s beach reading. Now bugger off, I’m on a deadline. My first novel, Silk for the Feed Dogs, written over a hectically productive period of, um, gosh, years is available here. Good for you. Whatever pushes you forward. Wishing you the best of luck. And the steeliest of determination! Catching up with my blog faves after time away – of course you’re on the list. Hilarious – no skin off your Na-Nose – hehehehe. I agree with your take on what would have happened to your head last year if you delved into NaNo. 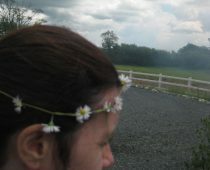 I was so tripped up by the name of the thing when I first started blogging, I thought I was seeing things. You go girl and make it work for you. Looking forward to the next Jackie Mallon book hitting the shelves. Thanks Francis, I have my NaNose to the grindstone and hope not to disappoint. Congrats on setting goals (and achieving them). It must be a great feeling sitting down, ignoring the whole world and spending time with all the wonderful thoughts in your head…putting them to paper … You inspire us all. My sentiments exactly! I was just thinking the other day – you COULD write a novel in a month if you just put the plan in action. So why haven’t I finished ‘What Line’ yet? We can do this Jackie! And by the end of the year! GO!